Marcussen et al. in their systematic review showed that a single preoperative dose of amoxicillin lessened the occurrence of surgical site infection (SSI) and a single dose of penicillin lessened alveolar osteitis (AO) incidence. We carried out our study to verify the relation between postoperative antibiotic usage and inflammatory complications (SSI or AO) after M3 removal. Our hypothesis was that postoperative antibiotics will lessen inflammatory complications. We carried a prospective cohort study. We derived the sample from the enrolled patients in a Practice-Based Research Collaborative (P-BRC) of Saudi Arabia private practitioners who were oral surgeons, from January 1, 2017, to May 31, 2018. The study has registered ethical committee approval and consent was obtained from all subjects (KFSH/E15A/2017). Sample size was determined from a similar studies using the formula: n = [(z∝ + zβ)σd]2. With a confidence interval of 95% and power of 95% for the study, a sample size of 35 was obtained. The sample was randomly categorized in to two study groups: group A, in whom postoperative antibiotic was given, and group B, where antibiotic was not prescribed. The observed primary variable was occurrence and type of inflammatory complication (AO or SSI) after M3 removal. SSI was considered if there was a frank purulence at the extraction site or edema postoperatively. AO was diagnosed on basis of a history of new-onset or increased pain after 36h postoperatively and clinically at extraction site showing loss of blood clot with exposed bone. Other aspects assessed were gender, age, body mass index (BMI), habits, and medical history. Before extractions, Preoperative Disease Severity Score (PDS) was assessed by adding the whole number of preoperative disease conditions such as caries, periodontal disease, infection, resorption, fracture, adjacent tooth pathology, or supra eruption. If M3 were disease free, a zero score was assigned. Similarly Operative Difficulty Score (ODS) was measured by a scale of 0 to 6 (0, M3 not extracted; 1, erupted, nonsurgical removal; 2, erupted, surgical; 3, impacted in soft tissue; 4, impacted in bone partially; 5, impacted in bone fully; 6, impacted in bone, complicated or difficult). Thus obtained data were entered on a Microsoft Excel sheet and descriptive statistics were computed for all the study variables using SPSS 22.0 software program (SPSS® Statistics; IBM, Armonk, NY). A P value of less than 0.05 was treated as significant. Thirty-five oral and maxillofacial surgeons took part in the P-BRC. A total of 972 patients were enrolled with 1396 third molars removed. When the desired data regarding whether antibiotic was used or not were considered, the sample reduced to 725 in whom 965 M3 were removed. 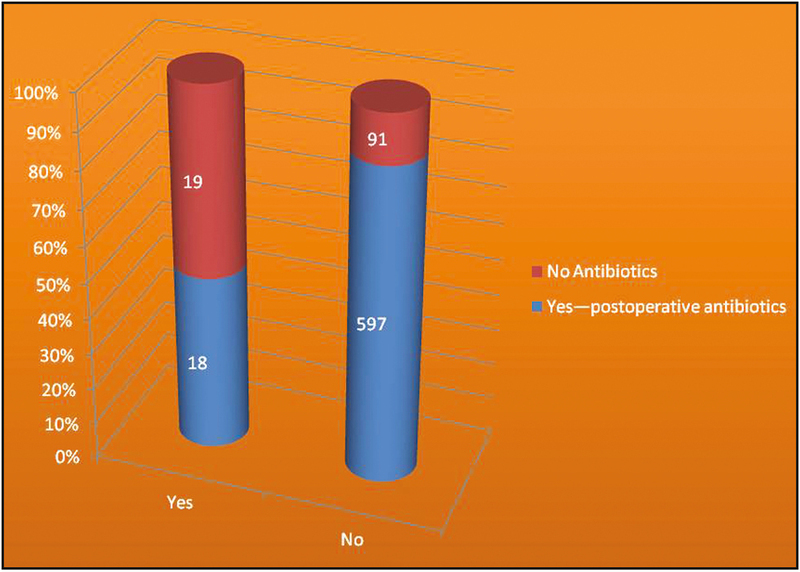 We found that 455 (62.75%) patients have taken antibiotics postoperatively. Demographic details showed that the mean age was 28±14.8 years. We observed a very high male preponderance of 543 (74.89%). Mean BMI was 26.7±6.3kg/m2. 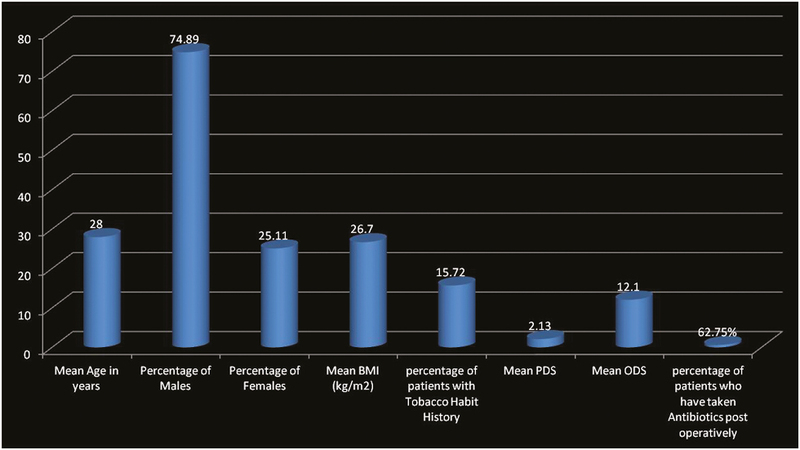 Habit history revealed 114 patients (15.72%) were consuming tobacco in some or other forms. The average number of M3 removed per person was 1.33. The mean PDS per patient was 2.13±2.1 and the mean ODS was 12.1±6.3 [Table 1] and [Graph 1]. 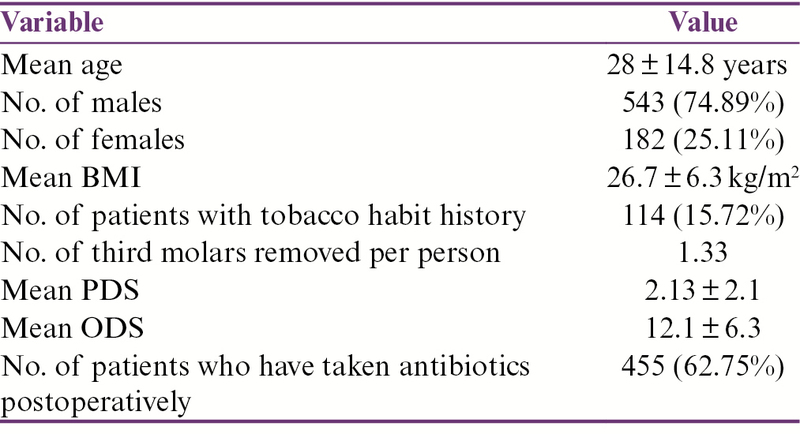 Bivariate association among the antibiotic usage and study variables was tabulated [Table 2]. The variables age and PDS showed statistically significant relationship with the usage or not of antibiotic, whereas BMI, ODS, and presence or absence of complications were insignificant. Bivariate association among the inflammatory complications and study variables was also tabulated [Table 3]. The variables gender, usage of tobacco, and ODS were associated with developing inflammatory complications, whereas age, BMI, and PDS were insignificant. Bivariate associations among antibiotic usage and inflammatory complications was recorded [Table 4] and [Graph 2]. The association showed that 63.73% patients took antibiotics. Frequency of inflammatory complications in the antibiotic group alone was 2.92% compared with 17.27% in the nonantibiotic group (relative risk [RR] = 0.17; 95% confidence interval [CI] = 2.8131 to 18.1790; P = 0.022). [Table 5] depicts the unadjusted association among antibiotic usage and AO. Incidence of AO in the antibiotic group was 4.0% compared with 6.3% in the nonantibiotic group (RR = 0.1677; 95% CI = 0.0854 to 0.3292; P < 0.0001). [Table 6] shows the unadjusted association among antibiotic usage and SSIs. Incidence of SSI in the antibiotic group was 0.5% compared with 2.73% in the nonantibiotic group (RR = 0.1789; 95% CI = 0.0366 to 0.8748; P = 0.0336). We noticed a statistically significant lower inflammatory complications in those who took antibiotics postoperatively than those who didn’t (P < 0.001). Our results are in accordance to Lacasa et al., who found that postoperative amoxicillin and clavulanic acid twice a day was more effective than single preoperative dose in lessening infection rates after surgical M3 extractions. Conversely Monaco et al. revealed that a postoperative amoxicillin 2g for 5 days did not lessened postoperative complications considerably in comparison to controls. Calvo et al. also observed akin findings of insignificant enhancement in postoperative events in persons who have not taken antibiotics postoperatively. Studies revealed that the most common complication after M3 extraction is AO, frequency ranging between 4% and 30%., In our study, AO was seen in 4.7% of all enrolled patients (postoperative antibiotic group, 2.43%; nonantibiotic group, 14.54%). Studies regarding the incidence of allergies to penicillin and cephalosporins found it to be at 9% and 1%, respectively. Bacterial resistance is a major menace for which no one can predict rates of resistance and dissemination. Medical professionals should make sure that the advantage of averting occasional infectious complications outweighs the negatives of abundant antibiotic prescribing. All the observations concerned with inflammatory complications were recorded by treating clinician after training them regarding our study methodology and variables AO and SSI standard definitions. 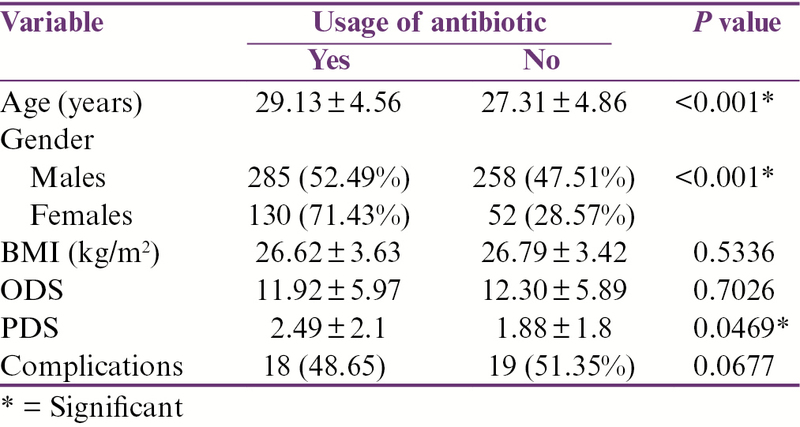 Other aspects that were not assessed regarding usage of antibiotics by OS were duration of surgery, amount of tissue trauma, systemic conditions of patients. Other limitation of our study is that we did not considered factors related to the competence and general characteristics of OS such as ability, technique used, level of training taken by them, training location, and practice location. In future, studies with larger sample size and more standardized model of postoperative antibiotic management, uniform postsurgical follow-up, and impending blinding of participants should be carried out. Our results implies that antibiotic therapy after M3 removal revealed a slightly reduced risk for inflammatory complications (AO or SSI). Although the sample was adequately large to present statistically pertinent data, the study results may not represent real clinical situation. In future, studies with a larger, more uniform sample with consistent postextraction follow-up and probable blinding of subjects to variables being gauged would be valuable to verify or refute the present observations. Morrow AJ, Dodson TB, Gonzalez ML, Chuang SK, Lang MS. Do postoperative antibiotics decrease the frequency of inflammatory complications following third molar removal? J Oral Maxillofac Surg 2018;76:700-8. Xue P, Wang J, Wu B, Ma Y, Wu F, Hou R. Efficacy of antibiotic prophylaxis on postoperative inflammatory complications in Chinese patients having impacted mandibular third molars removed: A split-mouth, double-blind, self-controlled, clinical trial. Br J Oral Maxillofac Surg 2015;53:416-20. Ren YF, Malmstrom HS. Effectiveness of antibiotic prophylaxis in third molar surgery: A meta-analysis of randomized controlled clinical trials. J Oral Maxillofac Surg 2007;65:1909-21. Prajapati A, Prajapati A, Sathaye S. Benefits of not prescribing prophylactic antibiotics after third molar surgery. J Maxillofac Oral Surg 2016;15:217-20. Marcussen KB, Laulund AS, Jørgensen HL, Pinholt EM. A systematic review on effect of single-dose preoperative antibiotics at surgical osteotomy extraction of lower third molars. J Oral Maxillofac Surg 2016;74:693-703. Dodson TB, Gonzalez ML. American association of oral and maxillofacial surgeons’ anesthesia and third molar extraction benchmark study: Rationale, methods, and initial findings. J Oral Maxillofac Surg 2016;74:903-10. Lacasa JM, Jiménez JA, Ferrás V, Bossom M, Sóla-Morales O, García-Rey C, et al. Prophylaxis versus pre-emptive treatment for infective and inflammatory complications of surgical third molar removal: A randomized, double-blind, placebo-controlled, clinical trial with sustained release amoxicillin/clavulanic acid (1000/62.5mg). Int J Oral Maxillofac Surg 2007;36:321-7. Monaco G, Staffolani C, Gatto MR, Checchi L. Antibiotic therapy in impacted third molar surgery. Eur J Oral Sci 1999;107:437-41. Calvo AM, Brozoski DT, Giglio FP, Gonçalves PZ, Sant’ana E, Dionísio TJ, et al. Are antibiotics necessary after lower third molar removal? Oral Surg Oral Med Oral Pathol Oral Radiol 2012;114:199-208. Courvalin P. Why is antibiotic resistance a deadly emerging disease? Clin Microbiol Infect 2016;22:405-7. Parthasarathi K, Smith A, Chandu A. Factors affecting incidence of dry socket: A prospective community-based study. J Oral Maxillofac Surg 2011;69:1880-4. Sigron GR, Pourmand PP, Mache B, Stadlinger B, Locher MC. The most common complications after wisdom tooth removal: Part 1: A retrospective study of 1,199 cases in the mandible. Swiss Dent J 2014;124 (10):1042-6, 1052-6. Pourmand PP, Sigron GR, Mache B, Stadlinger B, Locher MC. The most common complications after wisdom tooth removal: Part 2: A retrospective study of 1,562 cases in the maxilla. Swiss Dent J 2014;124 (10):1047-51, 1057-61. Macy E. Penicillin and beta-lactam allergy: Epidemiology and diagnosis. Curr Allergy Asthma Rep 2014;14:476. Lang MS, Gonzalez ML, Dodson TB. Do antibiotics decrease the risk of inflammatory complications after third molar removal in community practices? J Oral Maxillofac Surg 2017;75:249-55.